The genesis of Chopin's Grande Polonaise Brillante Op. 22 originates with his youth in Warsaw and his first tours as a virtuoso. Designed as a concert piece with orchestra, it takes up a special position among the Polonaises of Chopin. By tradition, however, the work has always been performed as an extremely effective solo piece. 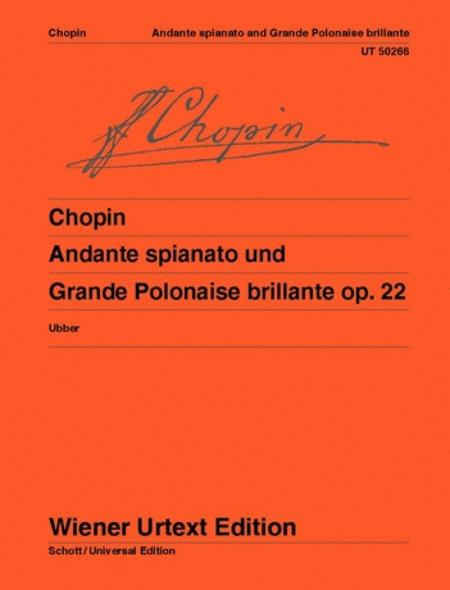 Since no autograph survives, various first prints are used as source material, and comparisons show that the English first edition must have been based on the autograph manuscript of Chopin. This edition therefore rates this English edition more highly than usual, and numerous discrepancies and omissions present in the French definitive edition are clarified and complemented. The notes on interpretation not only explain the relatively rare term "spianato" but also explain Chopin's techniques with respect to trills and appoggiaturas, and tempo rubato. 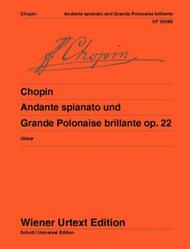 These explanations are drawn from sources close to Chopin, such as letters from his pupil, Karol Mikuli. For advanced players. you don't know the music, please listen to a great recording of it (either Artur Rubenstein or Garrick Ohlssen is suggested). It's AWESOME!!! !